The grove, a grouping of trees, intentionally cultivated or found growing wild, has a long diverse history entwined with human settlement, rural practices and the culture and politics of cities. A grove can be a memorial, a place of learning, a site of poetic retreat and philosophy or political encampment, a public park or theatre, a place of hidden pleasures, a symbol of a vanished forest ecology, or a place of gods or other spirits. 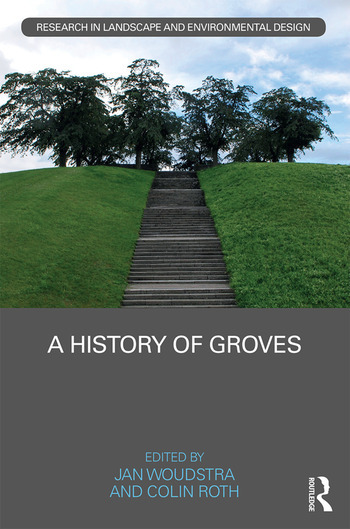 Yet groves are largely absent from our contemporary vocabulary and rarely included in today’s landscape practice, whether urban or rural. Groves are both literal and metaphorical manifestations, ways of defining spaces and ecologies in our cultural life. Since they can add meaning to urban forms and ecologies and contribute meaningfully to the significance of place, critical examination is long overdue. The editors have taken care to ensure that the text is accessible to the general reader as well as specialists. Jan Woudstra is Reader in Landscape History and Theory at the Department of Landscape at the University of Sheffield. His MA thesis at the University of York explored the wilderness in seventeenth- and early eighteenth-century gardens, and he has retained an interest in the topic, evidenced in various publications including ‘The Early Eighteenth Century Wilderness at Stainborough’, New Arcadian Journal, no.57/58 (2004–05), pp. 65–84. In 1997 he completed his PhD at the Department of Geography, University College London, with a thesis entitled ‘Landscape for Living; Garden Theory and Design of the Modern Movement’. Colin Roth is an interdisciplinary specialist in the psychology of aesthetics. His primary research field is in Danish culture through the ‘long’ nineteenth century, and his articles have appeared in the Royal Library Copenhagen’s journals Fund og Forskning and Carl Nielsen Studies, more recently in a sequence for food professionals in Chef magazine. He has been a regular lecturer at the Tate and the Royal Academy of Arts. His editorial work began in the 1980s with the first Journal of the Derby Porcelain International Society, since when his wide disciplinary range has enabled him to work across the fields of musicology and ballet, art history, architecture and landscape. Dr Roth is currently co-director of the Centre for Nordic Studies at the University of Sheffield.